C4H Comment: It’s really great to see the pensions industry at last responding to the clarion call that the UK has been sending out by overcoming the inertia of associated market risks. We do however believe there are more secure routes for investors, that will also have a greater impact for each community. Unfortunately the Pru investment has No underwritten yield, No additional social good and does not immediately contribute to the shortfall in social housing. 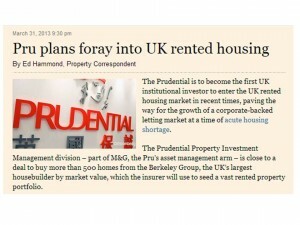 The Prudential is to become the first UK institutional investor to enter the UK rented housing market in recent times, paving the way for the growth of a corporate-backed letting market at a time of acute housing shortage. The Prudential Property Investment Management division – part of M&G, the Pru’s asset management arm – is close to a deal to buy more than 500 homes from the Berkeley Group, the UK’s largest house builder by market value, which the insurer will use to seed a vast rented property portfolio. The planned move was hailed by UK property experts as a “sea-change” in the shape of the country’s housing market, which has endured its lowest level of peace-time supply since the 1920s – the 110,000 homes built last year compared to demand for 240,000. The deal, which is expected to close this week and will value the portfolio at about £140m, will see PruPim take control of the entire rental business that Berkeley established with the Homes and Communities Agency in 2010. Savills, the property agency, will manage the portfolio, which is spread across London and the south-east, say people familiar with the matter. The UK’s insurers and pension funds were once among the largest owners of residential property in the UK, but sold off their estates in the years after the second world war due to the intensive management required. Both Legal & General and Aviva are looking at entering the private rented sector; both are understood to have eyed various potential developments and tie-ups with housebuilders. “The case for institutional investment in private rented sector [PRS] residential is compelling,” said Bill Hughes, head of real estate at L&G Investment Managers. “The benefits include diversification versus other assets, including commercial property, and attractive levels of returns for the level of risk being taken. Currently the scarcity of well specified PRS makes the opportunity more appealing,” he added.